Hello there– How’s your summer going?? We are melting here! A couple days ago the weather AP said it was 109 degrees in our town! Yikes! So it’s lots of fizzy water and air conditioning on for us here. All of which, has nothing to do with Coconut Cake! But I’m just hoping you’re staying cool too. Made this cake for dinner at Jeff & Betty’s on the 4th. About 30 of us end up there every year for a grand pot luck and sitting in lawn chairs and listening to Jeff’s rousing patriotic playlist while we watch the city fireworks!! It’s sweet & creamy & fruity. Just right for cutting into with friends! Make the cake according to the directions on the package. Mine called for 1 cup water, 1/3 cup vegetable oil, 3 eggs. Beat the batter with an electric mixer for 2 minutes. Then fold in the coconut with a spoon. Pour the batter into three 9″ cake pans that have been sprayed with cooking spray. Bake them about 20 minutes, until they are lightly browned and firm to the touch. Let the cakes cool completely before you add the frosting. To make the frosting, use an electric mixer and beat together the cream cheese, butter, powdered sugar and vanilla. (Start the mixer on low or the powdered sugar will fly out of the bowl!) Beat until it’s creamy. Take out 1 cup of the frosting to another bowl. 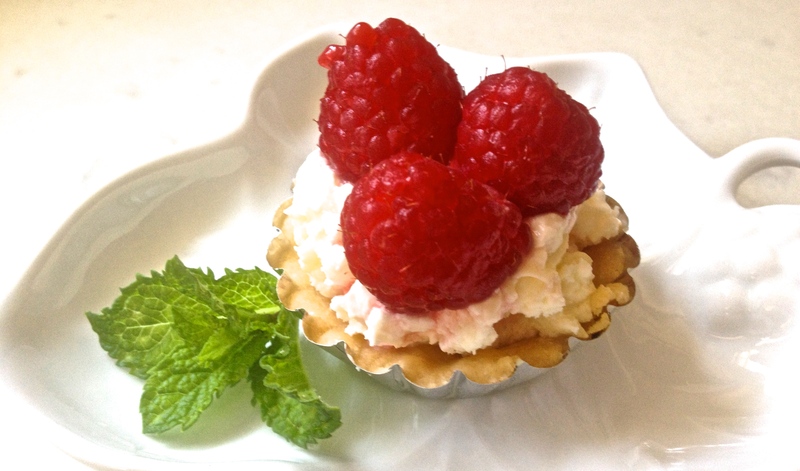 Beat in 1/4 cup of the raspberries with the mixer to make the filling. To put the cake together, set the first layer on a pretty plate and top with half of the filling. Then set the second layer on top and cover with the second half of the filling. Top that with the third layer. 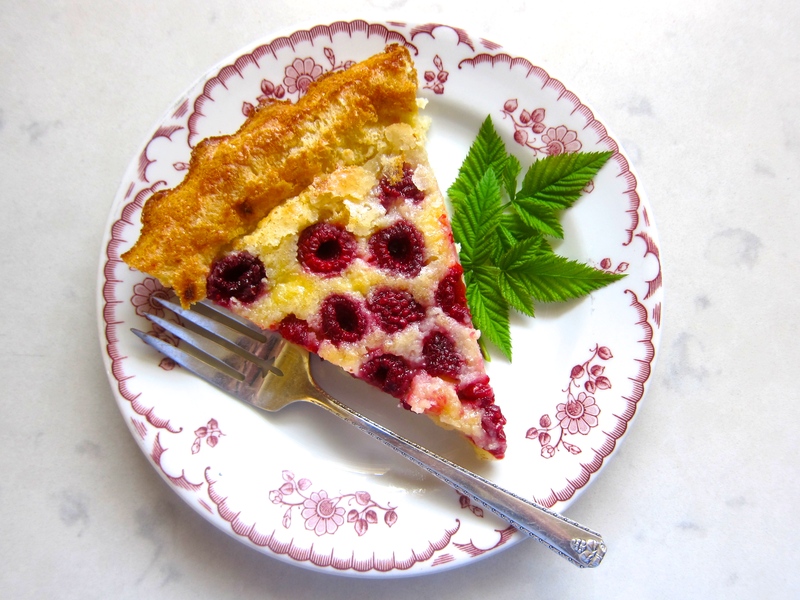 Garnish with the leftover raspberries, daisies and leaves. So pretty! Hello all– Sunday night was the best. A few friends gathered to wish Jenon well on her new retirement! We were like the fairy godmothers in the “Sleeping Beauty” movie, giving her the best wishes and blessings around the table for all that is ahead. She is the dearest. People helped bringing in parts of our meal and we ended with cake (of course!). 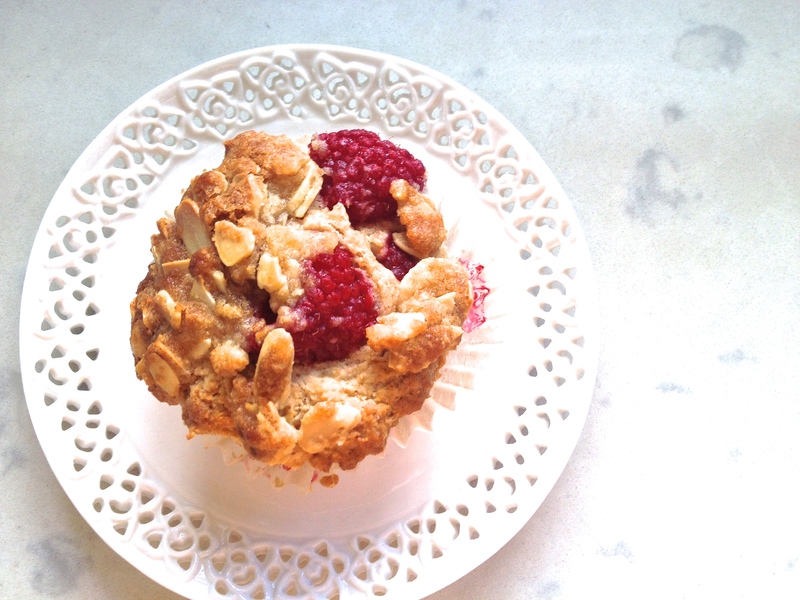 This sweet simple cake with summer raspberries. I think you’d like it if you have a celebration around your house. Make the cake according to the directions on the box (mine used 1/3 cup oil, 3 eggs and 1 1/4 cup water). Stir in the cut raspberries and spoon the batter into three 9″ cake pans that have been sprayed with cooking spray. Bake about 25 minute at 350 degrees until the cake is lightly browned and firm to the touch. Let it cool completely before piling on the frosting! To make the frosting use an electric mixer to beat together the cream cheese, butter, vanilla and powdered sugar. (If your frosting seems too thick add a tablespoon of milk.) Start the mixer slowly so the powdered sugar doesn’t fly out of the bowl! Frost the cake layer by layer and garnish with berries, flowers and leaves. Pretty! *You can use any non-toxic greenery with your berries– this is just what we have in the yard. We call the little flowers “Aunt Blanche daisies” because the we all have gotten seeds of these from Aunt Blanch years and years ago and they just sprout up unheeded all over the yard. To make the streusel, mix together the 1/2 cup sugar and 1/3 cup flour in a small mixing bowl. Then cut in the 1/4 cup butter with a pastry blender (or two forks). Set aside. For the cake, in a mixing bowl stir together the 2 cups flour, 3/4 cup sugar, baking powder and salt. Then add the milk, yogurt, oil, egg, lemon juice and grated lemon peel and stir it all until it is blended together. Then gently fold in the raspberries. Spoon the batter into a 9″ cake pan (or I used a 10″ tart pan) and then sprinkle the streusel evenly over the top. Pop it into a 350 degree oven for 45 to 50 minutes. After you pull the cake from the oven, let it cool 10 or 15 minutes and then drizzle the glaze over the top. Beautiful– and ready to eat! Hello Friends– Hope you had a marvelous 4th of July. Happily we had Ani & Brian down from San Francisco for the weekend. We spent one good long morning in the huge M&L Fabric store rustling up ingredients for a new baby quilt (loved that!) and yelped up a new favorite mom & pop Mexican place for lunch. We sat over long breakfasts and cups of coffee and on the 4th we all made the trek up to Ojai for the local Independence Day parade with Micah, Jodi and the grand-girls. It was just great. In a mixing bowl, stir together the flour, sugar, baking powder and salt. 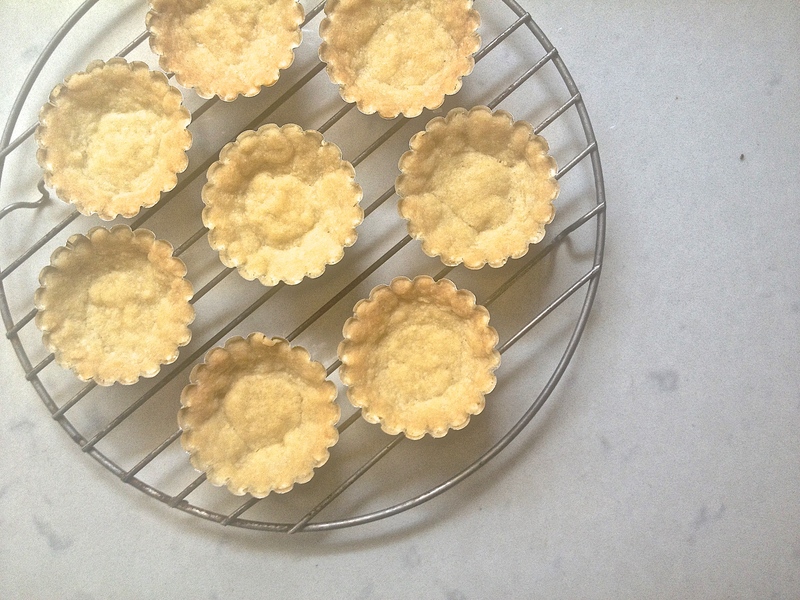 Cut in the butter with a pastry blender or with 2 forks until the mixture resembles coarse crumbs. Then mix in the eggs and whipping cream. Finally carefully fold in the raspberries (they will break up a bit). Turn the dough out onto a floured counter and shape it into a disc about 2″ thick. Cut about 20 small circles with a cookie cutter and set them on a baking sheet sprayed with cooking spray. Bake the scones at 400 degrees for 12 to 15 minutes until they are nicely browned around the edges. While they are baking, whisk together the powered sugar & 2 tablespoons of the cream to make the glaze. If it seems a little dry, add the 3rd tablespoon of cream. When the scones are all baked,drizzle on the glaze and they are ready to eat still warm from the oven!! Parade watchers in Ojai, our post parade picnic– and 3 enthusiastic flag wavers! Hey there– I can’t walk through the market nowadays without picking up a carton of some kind of berries– knowing that summer will soon be over and I’ll be moving on to apple and pumpkin kind of baking. But for now there are peaches and berries and watermelon in the fridge. Sweet summer. I like to make the topping first– in a small bowl stir together the melted butter, 6 tab. brown sugar, 2 tab. white sugar and 6 tab. flour. Then carefully fold in the almonds. Set it all aside for a couple minutes. Then mix together the 1 cup wheat flour, 1 cup white flour, 1/2 cup brown sugar, baking powder and salt. Stir in the oil, milk and egg. And finally, gently fold in those raspberries. 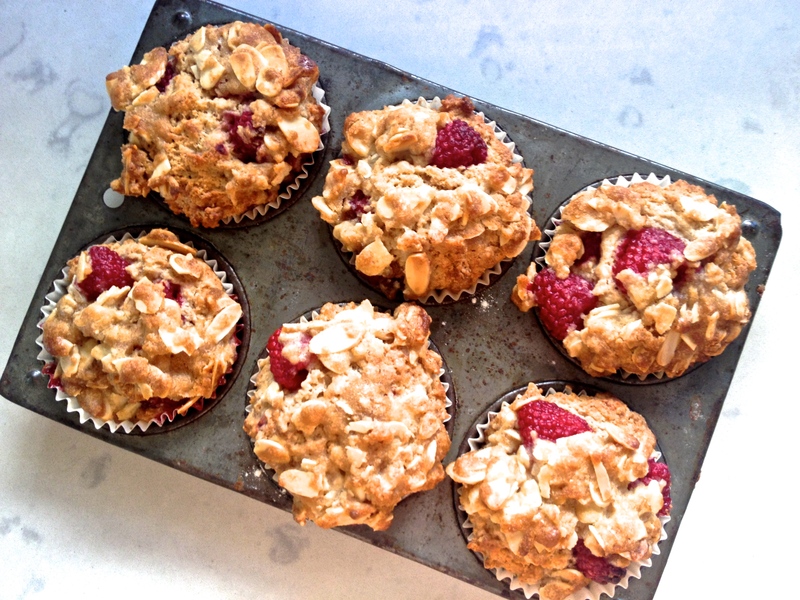 Spoon the raspberry batter into 12 muffin cups lined with muffin papers. With your fingers break up and sprinkle the topping on over the muffins– and pop them into a 375 degree oven for 15 to 20 minutes until they are nicely browned and springy to the touch. Cup of tea, hot muffin with a bit of butter. Just about perfect. Hi all– Sad to say, some of my favorite teaching buddies are retiring this year– Actually it’s sad for me, but pretty great for them!! They have big plans ahead– mostly involving grand-kids and traveling! To make the crust, mix together the flour, 3 tab. sugar and salt. Then stir in the melted butter and egg yolk. When that’s all blended press teaspoon-fulls of the mixture into mini muffin tins that have been sprayed with cooking spray*. This should make 25-30 little pastry crusts. Put them in the oven at 350 degrees for 12 to 15 minutes until they are nicely browned. While they are cooling, with an electric mixer, beat together the cream cheese, 1/4 cup sugar and vanilla. In a separate bowl, beat the whipping cream until it is fairly firm. Then fold the cream cheese mixture and the whipped cream together and spoon it into the little cooled crusts. 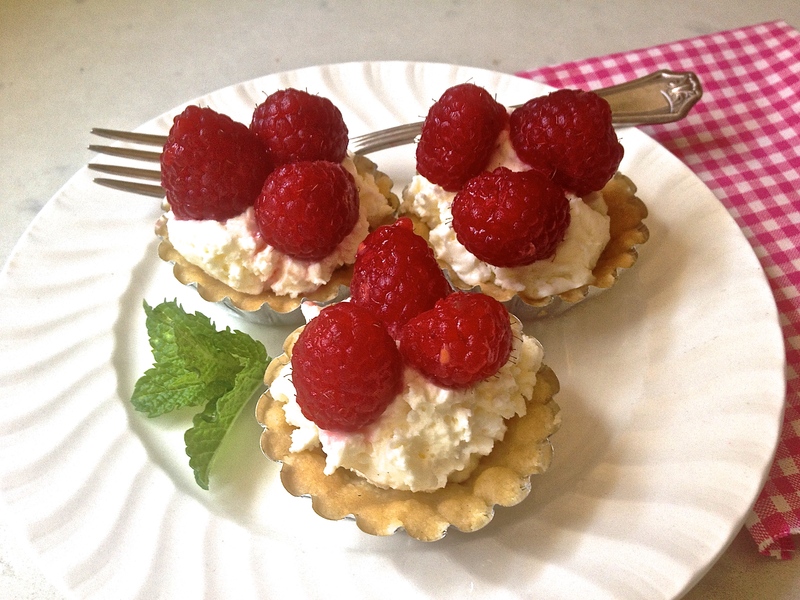 Top them with raspberries (or whatever pretty berries you like). Enjoy! *This recipe would work great with mini muffin pans. I had this little metallic muffin liners — available in SF at Kaiwen restaurant supply store– so I used them. Hey there– Those people at the Sprout’s market are pretty clever– They know if they mass boxes of pretty pink raspberries right by the front door of the store– so that you have to walk right on past them to get to the bread or bananas– well, they know, you won’t possibly be able to resist a tubful. It works every time. And after you’ve brought those tender little berries home, here’s a delectable way to consume them. You can put the whole dish together in a few minutes and sit down with a book til it comes out of the oven. Perfect! In a mixing bowl stir together the flour, sugar and salt. Then whisk in the milk, melted butter, eggs and vanilla. Pour is it all into a 10″ baking dish sprayed with cooking spray. Sprinkle the raspberries and sugar on top and pop it into a 400 even for 45 minutes until it’s puffy and nicely browned. This little dessert is so good hot or cold– an even better with a plop of whipped cream on the side. Hope you run into some sweet berries and give it a try!